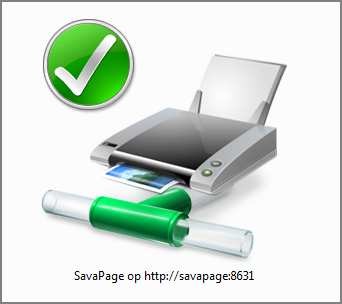 Any desktop system can print to SavaPage with a PostScript printer driver. The driver can either be generic, or a mainstream one from a vendor as shipped with the OS, or a dedicated one provided by SavaPage. When printing from public Internet a private Device URI must be used. See Section 3.10.1, “Internet Printer”. Although the SavaPage driver is not required, beware that vendor-specific drivers might offer options that are irrelevant, or not supported by the SavaPage Print Server. The SavaPage Printer Driver comes as a PostScript Printer Description (PPD), as captured in the SAVAPAGE.ppd file located in the shared client directory /opt/savapage/client. The driver is optimized for SavaPage printing. Irrelevant options, like Duplex Printing are stripped, other options like Paper Size and Resolution, are narrowed down to the most common choices. If you feel options are missing please let us know. The driver file can be downloaded from the About section of the User Web App and Admin Web App. The installation scripts below use the SavaPage printer driver. When you want to use a PostScript driver already present in the OS, please use the proper selection dialogs. The SavaPage JetDirect Server accepts PostScript print jobs only. So do not use the JetDirect protocol unless you are absolutely sure that the print client uses PostScript as Print Job Format. Windows clients can safely use JetDirect. On macOS and GNU/Linux systems IPP and IPPS are the obvious choices. When choosing a driver for the newly added printer in Ubuntu, make sure to opt for Provide PPD file, and to select the SAVAPAGE.ppd file. Enter ipps://savapage:8632/printers at Device URI for the default queue, or ipps://savapage:8632/printers/[queue] for any other specific queue. See Appendix E, URL Cheat Sheet. This is what the Printing Properties look like for a ready-to-print SavaPage printer in Ubuntu. Click the IP printer button and select IPP for Protocol. At Address, enter the IP address or host name of the SavaPage Print Server including the port number. Enter printers at Queue for the default queue, or printers/[queue] for any other specific queue. See Appendix E, URL Cheat Sheet. Enter the Name of the queue. SavaPage is the obvious choice here. Choose Other... in the Print Using selection box. This will immediately pop up a dialog where you can select the SAVAPAGE.ppd as shown in Figure 12.4, “SavaPage Printer on macOS: Select PPD”. This dialog selects the SAVAPAGE.ppd file from the local Documents directory. This is what a ready-to-print SavaPage printer in macOS looks like. When clicking the Default printer button in the Add Printer dialog, any Bonjour enabled SavaPage printer will show up, as configured in Section 12.3, “Printing from iOS”. This section covers the installation for Windows (including x64). 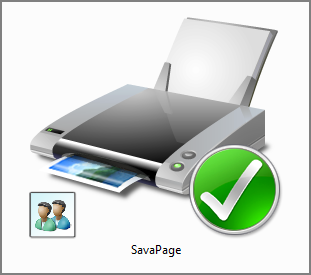 To add SavaPage as Local Printer, start the "Add Printer" dialog and choose add a new Local Printer. Create a new printer port of type Standard TCP/IP Port, and click the Next button. Choose device type TCP/IP Device and enter the hostname or IP address of the SavaPage server. When asked for a printer driver, choose a PostScript printer driver from the list. Any type/model will do, as long as it generated PostScript spool files. It makes sense to select just a simple type/model, without fancy options. Assuming you named the printer “SavaPage”, you should now have a printer as shown in Figure 12.6, “SavaPage Local Printer on Windows”. Print a test page to see if everything works as expected. 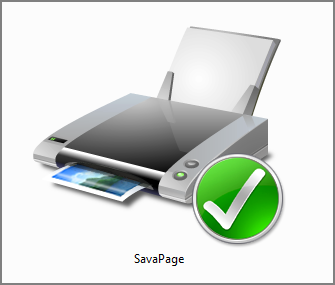 Install SavaPage as shared printer on a Windows Print Server. This makes the printer a member of Active Directory. See Figure 12.7, “SavaPage Shared Local Printer on Windows”. Queues created on Windows Print Server can easily be deployed on workstations using Windows Domain Group Policy or using Logon Script. Please consult the Microsoft Windows server documentation for more information. To add SavaPage as Network Printer, start the "Add Printer" dialog and choose add a new Network Printer. Select "Connect to a printer on the Internet..."
Enter the URL for the SavaPage printer queue. Choose a PostScript printer driver from the list. Any type/model will do, as long as it generated PostScript spool files. It makes sense to select just a simple type/model, without fancy options. Assuming you named the printer “SavaPage”, you should now have a printer as shown in Figure 12.8, “SavaPage Network Printer on Windows”.